This pink lovely was created by Brenda Turner. 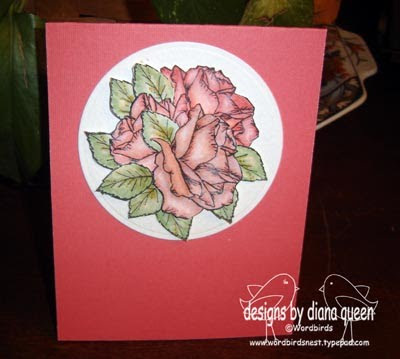 Love how she framed up the one rose in the oval and if you look closely she made a really special pink background stamping more of the leaves tone on tone and sponging it, so delicate and perfect, what a great look! Today's last card is by Diana "The Coloring" Queen. (hee! hope it's okay I called her that, couldn't resist!) Her coloring of these antique roses and the wreath she made encircling them with all these cut leaves had my jaw on the floor! And here you see the inside, what a great design to allow your recipient more time to ogle these beauties! Here is one of my favorite cards I made for this release, using a few buttons and the sweet little face and ear stamps from "Square Pegs". To make these bears you need: a 3/4" circle punch, 1 1/8" circle punch, 1 3/8" circle punch, and a small oval punch (mine is SU!). Stamp the face onto two colors of cardstock. Here I used Sweet Corn and Kraft. Use your 1 1/8" punch to punch out the whole face from one, then use the 3/4" punch to punch out just the nose and mouth from the other piece to create the little snout then pop this up over the nose and mouth on larger face. Stamp and cut out the ears. Punch the body from the largest 1 3/8" punch. Stamp the button image from the Square Pegs set or add a real one for a belly. Punch four small ovals for the limbs, then take some scissors and snip off one end of each oval about 2/3 down, curving your cut, this makes the perfect floppy stuffed arms and legs! Adhere and you're done! Here I made the pair with their arms around each other, awwwww! 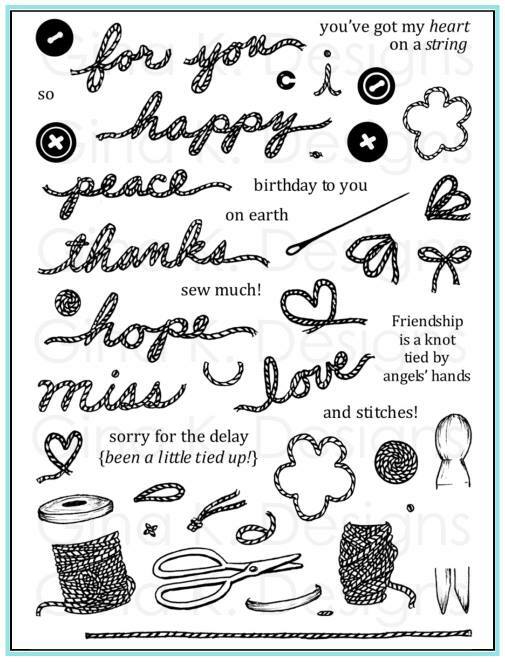 :) The sentiment from this set is stamped into the little stitched circle tab from the new Stamp TV Kit Organize it. Last I used the Scor-Bug to pierce some stitched borders around the sides and added faux stitching with my White inkssentials pen. Inside the card I stamped row of the large button image in brown. Welcome to the "Wishes and Dreams" Hop! Today I wanted to have Alicia's little fairy holding something else in her hand besides the wand, and I came across this cute print from the Cosmo Cricket Earth Love pack with all these dandelions blowing all over, perfect for a birthday wish! I colored and cut her out, then popped her onto the background, positioning her hand over one of the dandelions. I cut out two little borders for the bottom from different prints in the pack to make a border for the little lady to skip along and die cut some hearts for my accents and greetings, cutting a larger one around a smaller heart to make a little window for spotlighting the dandelion. The lighter aqua that I used on her skirt and wings was such a close match to the paper until I got it photographed: it has such a yellow undertone, but it does complement the paper. The Lipstick Red hearts and base I threw in to contrast these muted tones. Now, it's your turn! 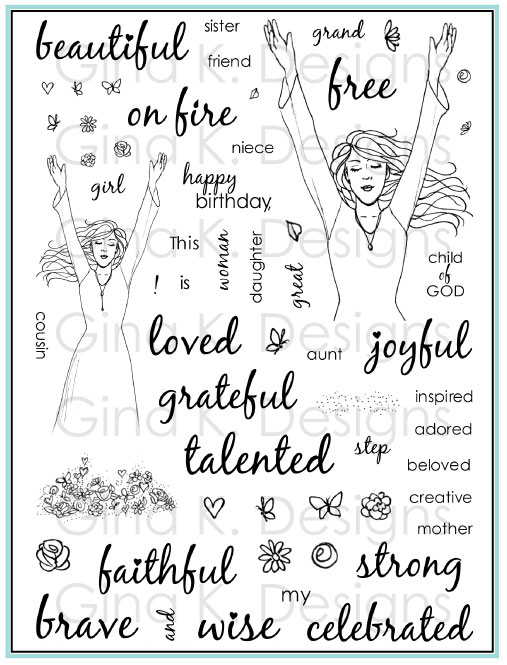 Please hop over to Gina's blog to add the direct link to your blog post showcasing Alicia's Wishes and Dreams stamp set in the Mister Linkey Box. Gina will have a special prize for the one link that she chooses out of all the participating bloggers - check out her blog for the details. In today's sample I used this perky little toaster from "Sung from the Heart". Look what popped up! I attached a piece of white CS I cut to resemble a slice of bread and sponged the edges with brown to give a nice and toasted look (hee!) then attached it to word window punched handle so it can go up and down to hide or reveal the greeting. Now, it's your turn! Please hop over to Gina's blog to add the direct link to your blog post showcasing Rupa's Sung From the Heart stamp set in the Mister Linkey Box. Gina will have a special prize for the one link that she chooses out of all the participating bloggers - check out her blog for the details. I squealed when I opened this week's "Square Pegs" sample from Brenda! I love using shapes stamps to create new images, this little shiny ladybug using the solid oval (egg) from the "Square Pegs" set for wings, love how it already has the little highlight! (greeting is from this set too), snipped in half and popped up, and circles from "Hip to Be Square" for the little body reveal and the smaller one for the head and tinier one for the dots, both from "Inspiration Mosaic" (plus the little dot for the spots from the same set!) was just so creative! You get SO much mileage from having all these large and small shapes in your stamp collection, they really open up so many possibilities when you are feeling playful, not just for backgrounds and borders... :) The pierced trail, black brads and dotted DP all tie it together, such sweet little details! Way to think outside the box, Brenda! Now let's go see what else she dreamed up for today here! Hello, my lava-lies!!! Welcome to the "Heartily Yours" hop! Now, it's your turn! 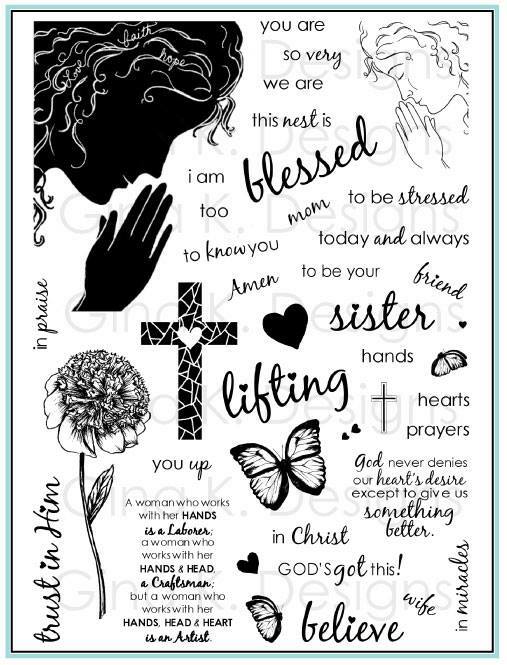 Please hop over to Gina's blog to add the direct link to your blog post showcasing Nina's Heartily Yours and Heartily Yours Additions stamp sets in the Mister Linky Box. Gina will have a special prize for the one link that she chooses out of all the participating bloggers - check out her blog for the details. Nina is offering a FREE download on her blog. However, she is asking for donations, if you would like to contribute, to help the earthquake victims of Haiti. All proceeds will go towards a worthwhile charity, The Children's Hunger Fund. More info can be found on her blog. No ribbon, no embellishments on this flat card(great for mailing), minimal supplies, but still very elegant! Have a great day, hope you enjoyed this Mosaic Monday! Bog hop coming up! Today I have a card with Alicia's little sleeping fairy from "Wishes and Dreams". Base is Ocean Mist and DP is Basic Grey Indian Summer, I loved how ethereal this print was with these long vines, like night blooming flowers. Although I don't usually throw in a color that's not key in my design, i love the contrast of the aqua with the pink and deep orange, and it does bring attention to the very small bit of aqua I added to the wings in just a few places to make them look iridescent, ink and lilac were added as well. On her hair I added highlights of white pen and Sakura Stardust gel as well. Card is adorned with large flourishes punched from Innocent Pink and blinged sateen flowers. The greeting is on a die cut circle, like the moon rising in the background. I've gotten several requests for how I color this Manga style art with my Copics, so I will be back with some step by step tips for coloring their skin, clothes, and hair, it is actually much easier than some of the techniques you've learned already with your Copics because this style is really based on hard lines and high contrast, rather than lots of blending of the shades which takes more time and practice. This weekend I am trying to get some of my favorite cards assembled in ot a few different posts for you from the Two year Anniverysary Blog hop, stay tuned! I actually made this as a New Years card (see the big balloon drop in the background? ), before realizing with our release I wouldn't be able to share this "Square Pegs" card until after new years, doh!!!!!!!!! But at least I figured that out before completing the card so I could put celebrate instead and I'll send it out for a birthday or anniversary (or very formal wedding) that works too! The shimmer and colors of this card was really hard to capture without having a funny glare so I took it from the side instead and you don't get all the sparkle but I will tell you about it: instead of white I used the new Gina K Pure Luxury Metallic Mother of Pearl, this is some seriously gorgeous paper! It has the most beautiful iridescent shimmer and golden undertone, and embossing it (D-vine Swirl) just makes those different layers sparkle even more. the balloons were rolled onto metallic Gold and Silver Ink Pads, stamping off some of the balloons to add dimension. Don't those look like real metallic balloons? I added some gold lined black organdy ribbon and silver metallic cording, around both the bow and behind my popped up balloon like a string, i just tucked it under the pop dot to secure the cord. The glasses I stamped (clink!) onto a small die cut Labels Eight and mounted on Pure Luxury Black Onyx. Last I added some adhesive rhinestones a for a little spearkle and fizz bubbly above the glasses. Wish you could all see this card IRL! :) Hope you have a very festive weekend, find something to celebrate, just for fun! ;) AND, if you can squeeze in some time to stamp, the Mr. Linky blog hop using the Square Pegs set on Gina's blog is open until Monday night, January 25th! I do hope you'll enter for a chance to win one of my sets, your choice! :) Don't miss your chance to hop! Thank you for visiting me today in our "Purrr-fectly Delightful" hop! No kitty today from me, though! Instead I inked up just the teacup portion of the image and stamped on glossy CS (works well as China! ), then inked up just the flowers from the vase image and cut them out and popped them out on top to make a little teacup garden. I adhered my Copic colored image onto this plaid pattern from Basic Grey Sugar Rush, just to do something a little different than a plain colored, white or sponged mat. Card base is Pure Luxury White, green print is Basic Grey Lime Rickey, and mat is Moonlit Fog to match the stripe in the plaid. Button is from the Gina K Autumn Assortment and gingham ribbon is from the Romance Assortment. Now, it's your turn! 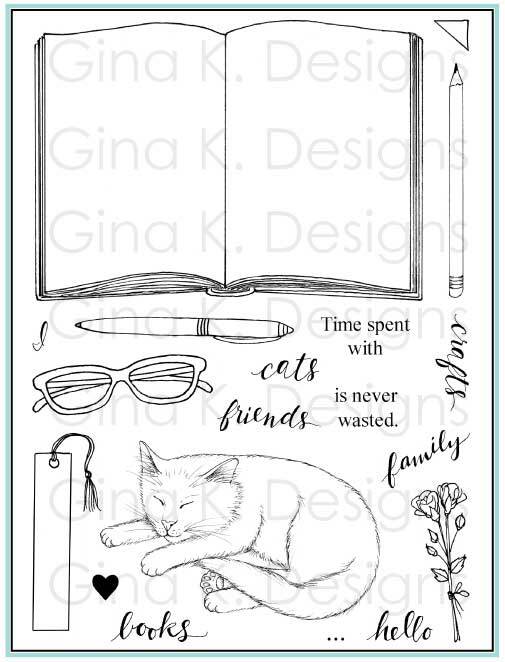 Please hop over to Gina's blog to add the direct link to your blog post showcasing Theresa's Purrr-fectly Delightful Stamp set in the Mister Linkey Box. Gina will have a special prize for the one link that she chooses out of all the participating bloggers - check out her blog for the details. Have a purrr-fectly delightful day! 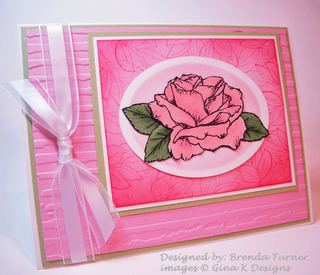 Please welcome my latest guest designer, Brenda Turner! Brenda will be sharing several projects using "Square Pegs" here and on her own blog over the next few weeks. 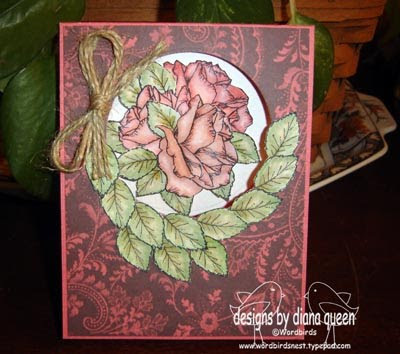 Today she has a shabby chic valentine, keeping the stamping to a minimum using just the XO image. She framed it up in a Labels Nine diecut, I like that she used this shape, it shows this image, even though it has right angles, isn't just for squares! ;) Her design uses the stamp like both the focal point and greeting and then she got to play around filling up the background with embossed layers of Basic Grey Bittersweet prints and Pure Luxury pinks using more die cuts. My favorite techniques are sponging and coloring. It is rare that I make anything that doesn't have at least one if not both of these techniques. I love almost all colors, with blues and greens being my favorite. I tend to use earth tones a lot to. A Year of Flowers, it is so fun to color and create groups of flowers. A Year of Flowers is my most used Gina K set. I did a little stamping in the late nineties, but went back to work after being a stay at home mom. With work and being a wife and mother I had no time for stamping and had to give it up. Then about 3 years ago I was invited to a Stampin' Up party and I was bit by the stamping bug in a big way. Mostly other paper crafters. 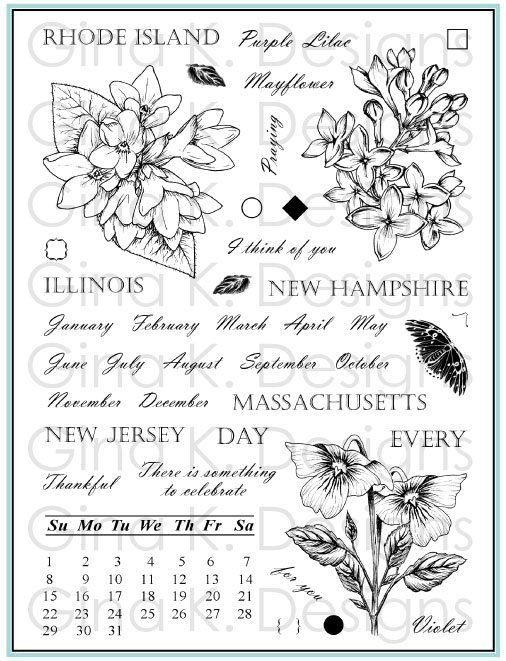 I enjoy looking at blogs and the SplitCoast Stampers gallery. My favorite place for inspiration is StampTV, the gallery there is full of the most amazing creations. I would love to be published some day. Of course I would need to submit before that can happen. Any type of treat bag or box. I also enjoy making gift card holders. My biggest accomplishment was making Center Stage for StampTV. I was so happy and honored to be picked and I had the best time. I was also on the design team for Pile It On last year. I choose to step down from that position at the end of last year. I love the challenges on StampTV. I will do some other challenges if one strikes me, but mostly I stick with the StampTV ones. I hang out with my family. We love to go camping and kayaking when the weather is nice. Thanks Brenda! Let's go see what you else she has for us today! *you all know that they're related, right?! I always melt when I see kids in little pajamas or coats or costumes that have ears: well, check out these little "Square Pegs" cuties, and so easy to make! "Hip to Be Square" is stamped directly onto Basic Grey Lemonade DP and the border is colored in with a pink Copic. To make the faces, I stamped the baby face from "Hip to be Square" twice onto Blush Blossom and punched with a 1 1/4" circle punch, then to make the "ear hoodies" I punched a 1" inch circle out of Innocent Pink and Creamy Caramel, then put my 1 1/4" circle punch over the cut out round window and punch again so I had a "circle in a circle", see pic below. (I don't think I ever noticed that 1 1/4" in there before I took this pic, LOL!) I glued these over the blush punch outs so the little faces peek out, then just add ears! (from "Square Pegs") Insides of the ears are paper pieced with the same DP. You can also just layer a smaller punched face over the hood, but the way I did it here really makes the face seem like it's inside, KWIM? The heart is punched with the Extra Jumbo marvy Scalloped Heart Punch. Card base made with a Scalloped Sqaure Nestabilitie, button in the middle is from the Romance Collection. Brenda Turner, my guest designer this month! Now, it's your turn! 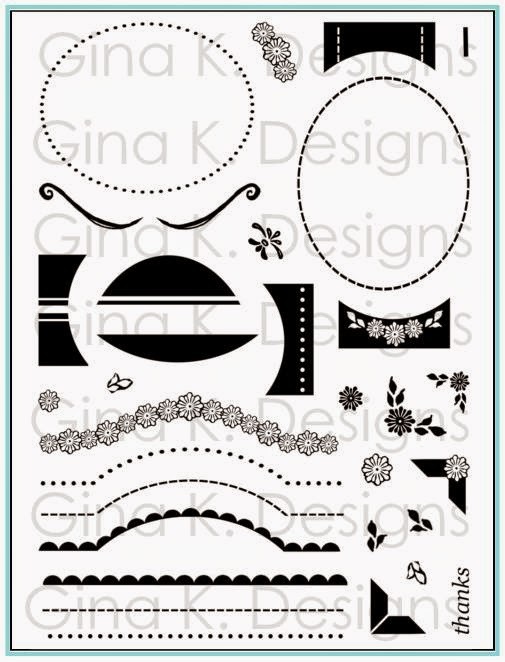 Please hop over to Gina's blog to add the direct link to your blog post showcasing my Square Pegs stamp set in the Mister Linky Box. Gina will have a special prize for the one link that she chooses out of all the participating bloggers - so check out her blog for that information. Today's card was inspired by a little thumbnail in an email I received (advertising trendy artwork for sale), of a poster hanging in a beautiful modern bedroom with a gorgeous black bedframe, piled high with back and white floral printed pillows and HOT pink sheets, all of this against a crisp white wall. Well, I could see this card in my head immediately! Simply stamp the "Inspiration Mosaic" grid onto Pure Luxury White and the new Passionate Pink CS, then cut out two of the sections from the pink to lay over the white. Before adhering these pieces, use Post-it notes to mask off two sections of the grid and stamp the flower from "Square Pegs" into the panes to make this black and white pattern. 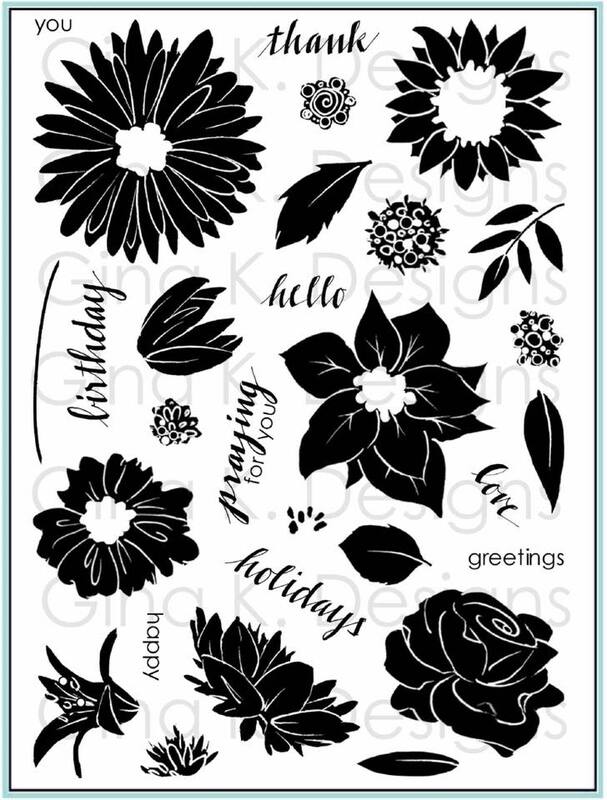 I am SO excited about this new flower image to make my own pretty, funky floral backgrounds in any colors I want! 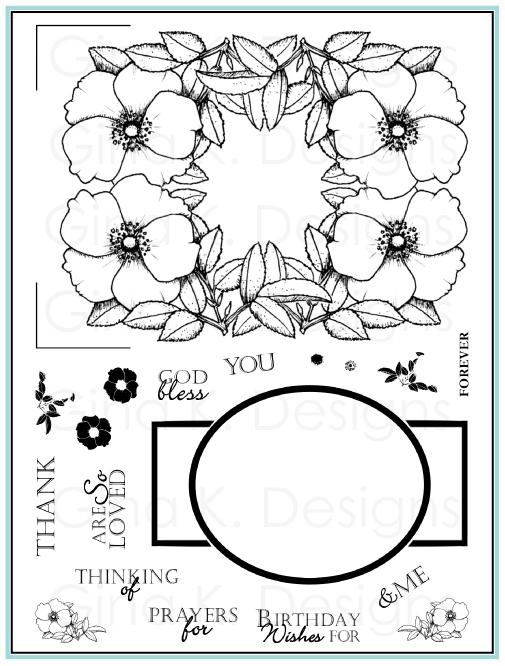 Stamp this again and punch out the Extra Jumbo flower punch from Marvy and layer onto a Super Jumbo flower punched from Black Onyx. I colored in one small section with a Black Copic but wanted to leave plenty of white space so left the other panes as is. Add the greeting and row of dots to the corner, run a black marker around the edge of your white mat to give it a border, and then layer onto a Passionate Pink base. Don't these colors just sizzle??? Tomorrow night we have a blog hop for my "Sqaure Pegs" set! See you soon! Today I have a "Wee Tees" sample using the "Square Pegs" set: after stamping my Onesie in Memento Black, I stamped the XO image all over it to make this super sweet hugs and kisses pattern and then simply stamped the heart over it. I popped it up onto a die cut Innocent Pink Scalloped Rectangle, and added little dots of Inkssential white pen to the border. Cardbase is white glossy, the Swiss Dot Cuttlebugging in this glossy finish looks like a hundred little pearls, so girly! last add some white ribbon and a romance button, and it's done! Hope you liked this card, and your day is sweet! Base is the new Innocent Pink and the Chocolate Kiss background I left smooth and unstamped, like silky smooth chocolate! I could eat this color combo up!! This card was so fun to make! As soon as I saw this kitty image in Theresa's "Purrr-fectly Delightful", I immediately thought back to when our cats were little and constantly batting and chasing something! More often than not it was string, and I can remember more than once hearing a huge racket from the other room as the cat got tangled up and starting ricocheting around the room like a pinball, meOW!!! LOL! TIP: To make the ball of yarn, simply punch out a 3/4" circle of cardstock and wrap some embroidery floss around the middle until the paper is entirely covered. You could use the same color CS as the floss and you won't have to use as much, although I didn't have forethought to do that her (oh well, the whole ball is way more authentic!) ;) Then wrap the remainder around the cut out kitty. I colored her with Copics and then added some tilted, wonky, scrappy layers of paper, green argyle print (like a sweater unraveling!) from Basic Grey Lemonade pack and some buttons. Cardstock is Pure Luxury Moonlit Fog, Smoky Slate, and Black Onyx. Base is Cuttlebugged with the Argyle Folder to match the DP. Have a GREAT weekend!! Lots to share here, see you soon! Thank you for visiting today! It's time for another GinaK CenterStage Spotlight Team Blog Hop! and the inside!!! My Perfect Pattern Pop Up Oven with the window frame and snowmen suitors peeping in again from Hip to Be Square, and the punched out little snowman (woman!) 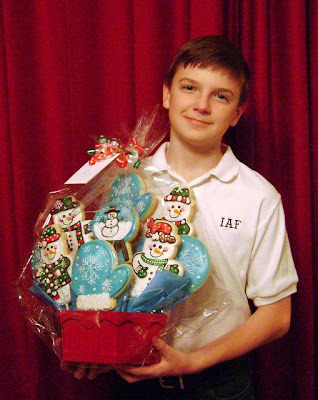 inside holding the tray of cookies! 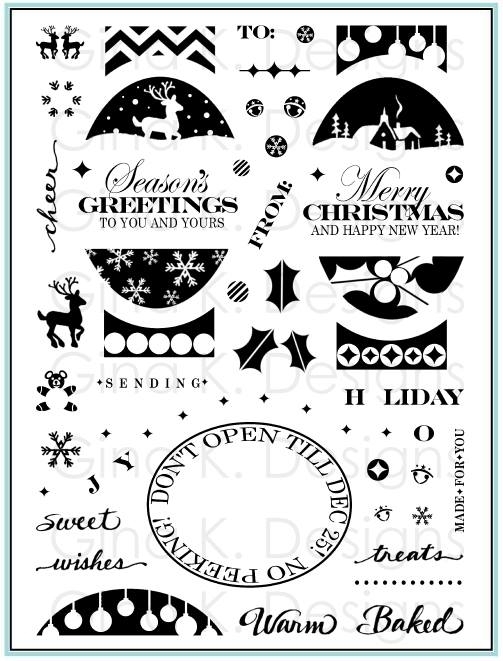 I stamped a greeting from the holiday Hospitality set onto a Petite Oval Nestabilities rug made from Ocean Mist that I Cuttlebugged with Herringbone. All DP is Basic Grey Eskimo Kisses, you can do the most fun matchy-match kitchens with these BG DP packs!! :) I stayed away from the very Christmasy ones in this pack like holly and Santa so it can just be a winter card I can send before the cold eason ends... Something else I really like about this card is that I printed the template onto glossy cardstock and now I have sleek, shiny counters and an enameled oven, see the reflection on the burners from the dials? Very sharp! Here is a project I shared at the party that I promised to come back and share more details and pics for: a pop top can full of get well goodies! All you need are a pop top can and smooth edge can opener, I got this one from Pampered Chef. * It is a great can opener to have, not having to worry about cutting yourself or your precious little kids fingers on a jagged edge! After taking off the BOTTOM lid, I removed all the contents, washed the can and removed the label. Now it is ready to alter, don't throw out that lid, because you're going to glue it back on! Although I took some liberties on the design to make it prettier, I intentionally made the top of the can red (the new Lipstick Red, cuttlebugged with Victoria) and framed up my soup bowl to look like a packaging label, referencing a can of Campbell's Soup, of course to go with my soup bowl image! The bowl is paper pieced with the same DP as on the bottom of the can, Basic Grey Junebug, doesn't that pattern look so elegant on the china bowl? I put a punched border of Black Onyx in between the two papers. 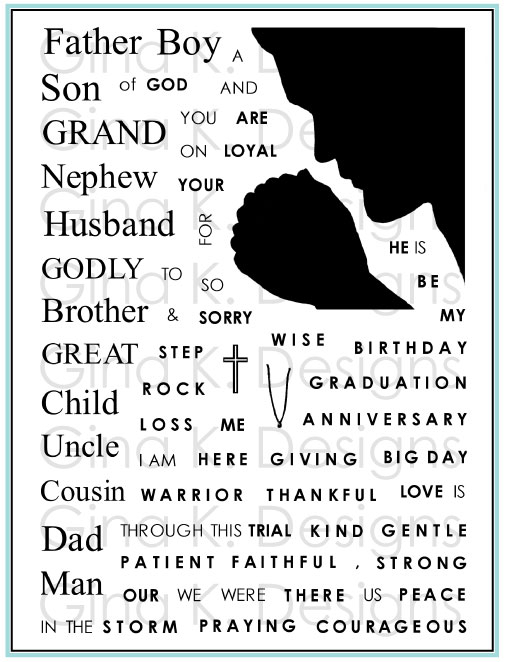 That gorgeous border around the image and sentiment is from the new StampTV Kit "Organize It!" and I just love how this looks around a single image and greeting from "Square Pegs"! I colored it with Lionet Gold Copic. After decorating you. re ready to stuff it with goodies! I put kisses and tea bags in mine. It is best to choose things that are individually wrapped if possible to keep the contents fresh and prevent a mess. Then you just glue the bottom back on and let it dry over night with a strong glue like super glue, E-6000, etc. Leave it bottom up and perhaps put something heavy on top of it. Hot glue might work also, if it does, let me know! Last I added some of the gold lined black organdy ribbon around the pop top, it looks prettier and makes it easier to grab onto the top to pull it up. Here is a closeup of the label. I actually cut out the middle of the bowl where the soup would be colored it in with Lionet Gold Copic, which I also used on the border, and then added the small strip of bowl above it with my Quickie glue pen. Instead of trying to snip around the steam, I just colored that part in with my white Inkssentials pen. I added a little shadow below the bowl onto the dish right over the pattern (this really adds a lot of depth to your paper piecing, try it! )and underneath it with C-3 Cool Gray Copic. * if you are looking for a GREAT Pampered Chef Consultant (or interested in becoming one), I'd like to recommend our dear friend Ana Lewis. My husband has know her since college and she already involved with Pampered Chef when I met her in 1997 (has a huge downline and earns the dream vacation every year), and has four children of her own, three of which she home schools, so she REALLY knows about juggling a family, home, career and still have time to make wonderful meals for the family while feeling pampered in the kitchen! A wonderful tip she had for me when she sold me on this can opener years ago (before I even had kids!) was to create a mini pantry so to speak of assorted emptied cans for her daughter's little play kitchen! She had stacks of empty fruit cocktail, tomato sauce and soup cans she was able to pretend going to the grocery store and use to "make dinner", so cute! You can find Ana's website here. This was a fun and quick card to make, using my new button stamp from "Square Pegs" on a Kraft base and a hodgepodge of real ones from the neutrals and new Gina K Romance Assortment! I started by stamping a random border with the button image in Memento Tuxedo Black and Versamark (difficult to see in this pic but I embossed the lighter ones, great to have that realistic shine and texture!) and then adhered the real buttons to create a collage using pop dots and glue dots. Last I added sime faux stitched over the button holes with my white Inkssentials and black glaze pens, the greeting and "free" pierced some little curvy trails in between to add more whimsy. Edges of card are rubbed with Cream White to soften the look. TIP: Don't have the color buttons you want? Stamp the button image and punch out with different size circles (or even a small squre!) to create some new buttons! I was out of town all weekend but will catch up on posts, I missed you!! Here is a card I made with Square Pegs and the new Pure Luxury Wine with Everything cardstock! So I had to start with a little wine! The bold glass image in my new set is so fun to use with a few simple techniques: rolling and direct to stamp. First, rock and roll the edges of the glass onto a gray pad rather than inking in it fully, this will give it a transparent look highlighting those edges. Then take a burgundy marker and fill in the bottom of the glass where the wine would be, and stamp! This way you can have your glass as empty or as full as you like! I love showing this kind of progression of emptying a glass with just one image. :) I did all the glasses the same way, just inking a little less each time and then cleaning the stamp before inking for the next, until I got to the empty one, but an easier way would have been to start empty and fill it up, working right to left! Solid heart was stamped in burgundy ink and then without reinking it I kissed my inked up XO block onto it and then stamped that onto my white cardstock to make the paler patterned one. These were punched with the Marvy extra Jumbo (yellow) Scalloped Heart punch. That gorgeous embossed background is the Victoria folder,(my new fave elegant folder!) I used adhesive pearls and Black Onyx CS to finish the card. This design with the glasses would make such a festive wedding, anniversary or anytime celebration card, but the little hearts are saying "Valentine"! I love you!! Cheers to the new year! The new XOXO image from "Square Pegs" fits beautifully inside the "Tech Talk" computer screen, just mask the edges before stamping to send someone cyberkisses!! 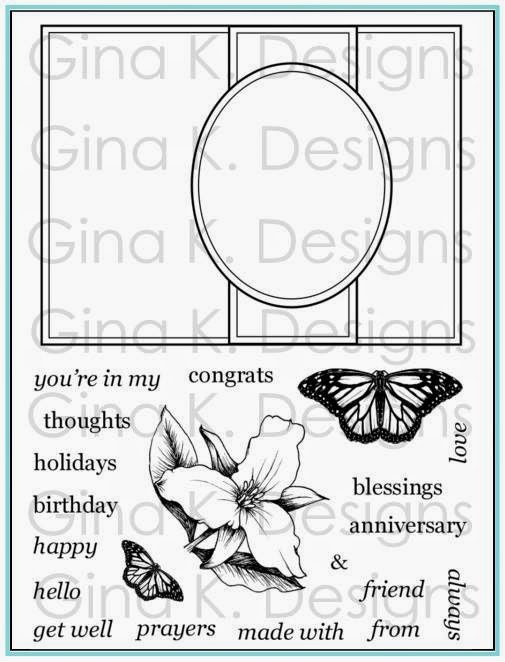 The XOs and heart are stamped in Vivid Brick and cut out and popped up on top, and I stamped the new little greeting onto one of the tab label images from Gina's new Organize it! STV Kit! Cardstock is the new Pure Luxury Lipstick Red, along with White and Black Onyx. Background is embossed with Heart Blocks Cuttlebug folder , and the dotted ribbon is also from the new kit! I'm so excited how these clean graphic images from "Square Pegs" for all seasons will be working with my computer set (among many others!) all year long! Okay, more in a bit! Hugs!!! Sneak Peek: Heartily Yours and a new Perfect Pattern! Nina Brackett has two totally fun and funky sets this month: "Heartily Yours" and "Heartily Yours Additions", the first a set of both trendy (lava lamp, groovy baby!!!) to timeless classics ( like this VW bug, hee hee!) and a set of extra greetings for even more options! I stamped the Bug in black and colored the open space she has for flames with some red and yellow Copics, cut it out and popped up, adding some adhesive nail heads to the wheels. isn't that cute how she did the sentiment , it's perfect with the little car! I cut some hearts with my Cuttlebug Dies in Rocket Red and mounted it on White, Black Onyx and Rocket Red base. I used the Scor-bug to make a little dotted road. Is that a fun card, or what?? Below is my original design for the card, I just changed it to the one above because I couldn't get it photographed as well as I would have liked but thought I'd go ahead and share the best pic becuase I still like the concept! This is a side-fold card, with the front scored in the middle and folded back, so it looks like a backward "Z" when you stand it up and view from the top. 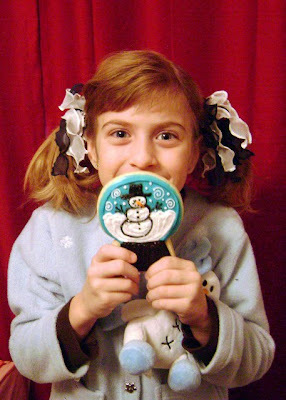 Finally, winners for my blog candy can be found in this post, thanks for your patience! See you at the party on Splitcoast Thursday 7PM CST, can't wait! 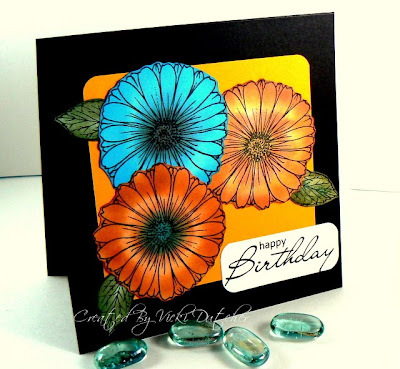 You are going to love GinaK's newest StampTV Kit "Organize it!" Oh my word, when I first saw the stamps included, I was just floored how useful all the images and words are, for making lists, tabs, planners in a pretty way, but also how beautiful and versatile the images and fonts she selected are, they go way beyond getting organized! The plans I have for the organizers will take a little more time to complete, and I suspect you'll see some awesome ones in our hop today, so I'll share some simple ones! The first stamp I had to ink up was the "little black book"! That Gina, she is feisty! The label was stamped in Memento Black on Pure Luxury White and punched with a 1 -3/4" circle. I stamped the heart from the set in cranberry ink and adhered it over the black one in the middle. And here's my LBB (little black book)! It's just paper, and A2 sized. Cut a 5 1/2"x 81/2" piece of Black Onyx cardstock and round the four corners with the small corner rounder punch. Now place one end in the Mosaic Cuttlebug folder, centered into the pattern so it leaves a space on the sides. Repeat on the other side. You will have about a 1/4" in between each embossed side with no pattern, this will be the spine, and you'll see how easy it will just fold at these edges without scoring! Emboss another scrap of black with the same print, and cut a strip 5/8" x 4" and round these corners also. Adhere the end with Scor-Tape to the back of the book in the middle. The closure tab is cut with a Cuttlebug Tiny Tag die, place a 5mm adhesive nail head over each hole on the ends, bend, then adhere to the front middle of the book, leaving a "hump" instead of adhering it flat for the strip to to easily pass through. That's it! You can put a Valentine message inside (with JUST your sweetheart's name and number! hee! (and maybe a rating! 10 of course!) ;) and present it as a card, OR attach a large post-it note pad inside , the long strip gives plenty of room for the book to expand. Adhere some pockets inside if desired. This thing totally looks like the real deal, I am just so excited about how it turned out! Oh, a quick update I was able to do with the set, I added some tabs from Pure Luxury White to my Tech Talk addy book I shared a couple weeks ago, using the same circle punch to go around the tabs. The space inside the semicircle is left blank to add the many tiny words included in the set. Too cool! 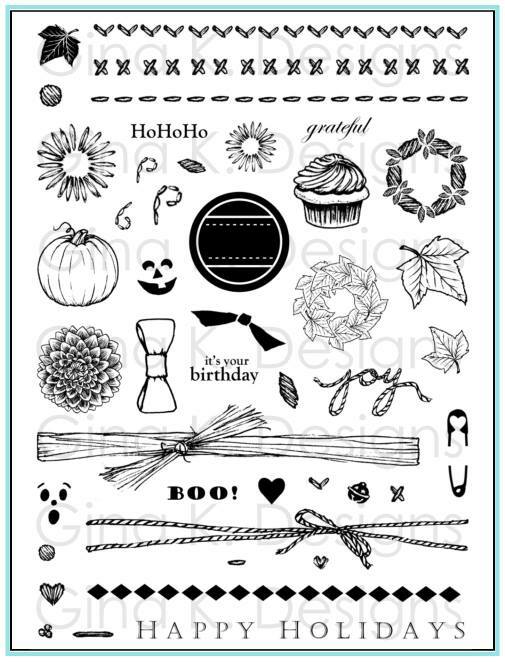 As always, the kit is packed with an amazing assortment of crafting goodies: 2 stamp sets, 24 sheets of heavy base cardstock, an assortment of brads, ivory sateen flowers and 12 yards of a variety of beautiful coordinating ribbons in 5/8" and 3/8" widths. Then, tune in to the newest StampTV video available tomorrow morning at StampTV as Gina will be sharing a special project she made with the new kit too!